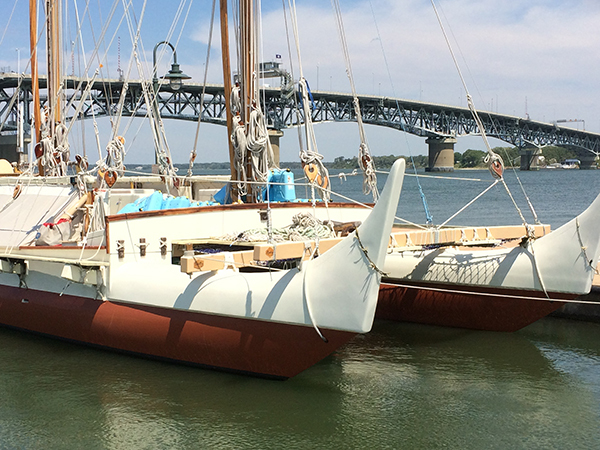 I had really looked forward to making the manu—those lovely, graceful bow and stern pieces. 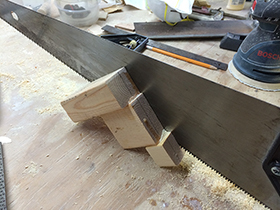 No more stitch and glue, or just cutting things out with a band saw. This required actual carving. I made a set and was pretty pleased with them. Then I realized I had made them wrong, and had to make a whole new set. This was perhaps the first time, but certainly not the last time, that I had to undo something and do it all over again. But I was determined to do it right. As Hokulani Holt-Padilla once said to me, "If you're going to build a canoe that can go 2500 miles and back, 'good enough' is not good enough." 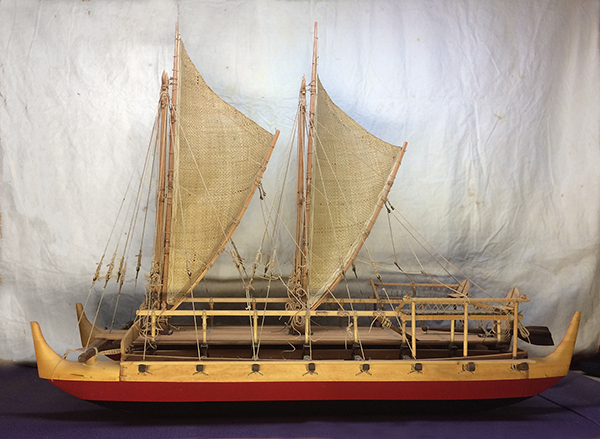 I stuck by that when I built Namakaiwa, and stuck by it building this model as much as I could. Carving the manu was fun. 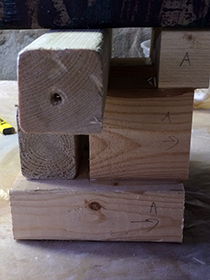 I stacked up three blocks of pine from 2x4's and 2x2's, in roughly the shape I needed so I could carve them down. 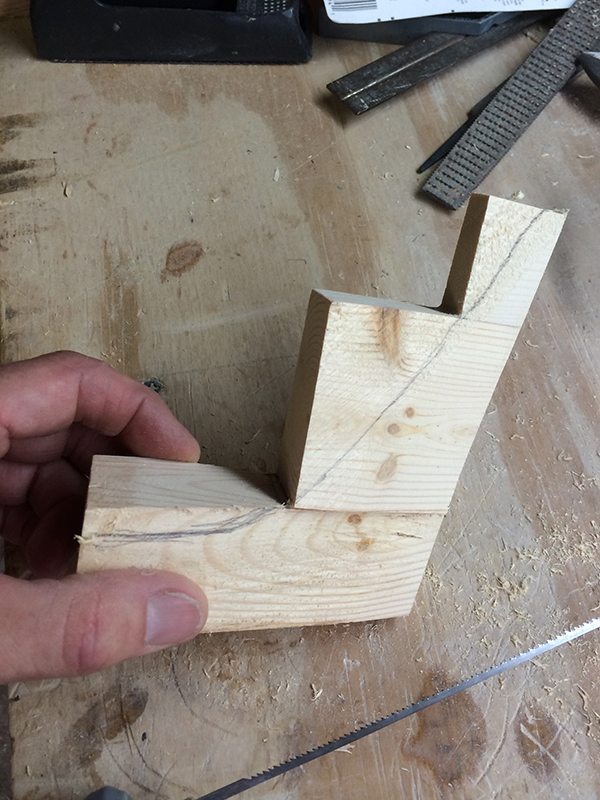 These I glued together like a staircase to give the angle of the manu. 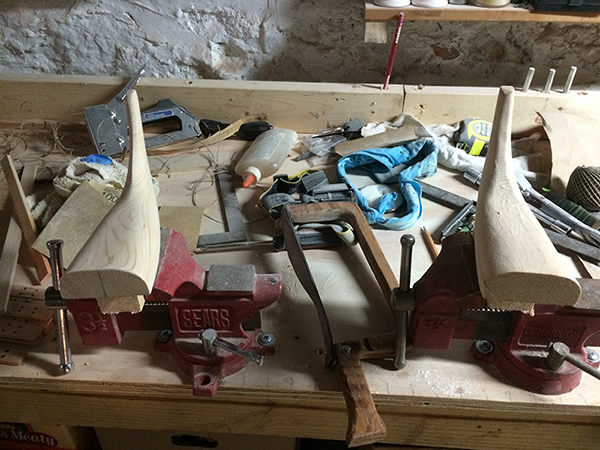 Then it was a matter of sawing these as close down to size as I could, before carving and sanding the final shapes. 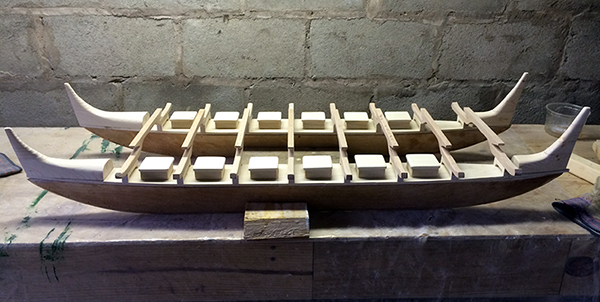 Gluing the blocks in an escalation, using extra pieces to make a level top for applying weight during gluing. Sawing off the sides at roughly the angle I think it should be, based on the width of the deck. Then the sides will need to be rounded somewhat. I have drawn a line to show the curve I want to cut, with I will do with a small jigsaw. Front manu, take 1. One sanded, one awaiting sanding. Note how the grain of the wood worked out. And so I set them aside, nice as I thought they were, and started all over again. In the end, I did a better job on the new ones than on the originals. To shape them, I screwed a piece of 2x2 to the bottom (knowing the bottom would never be seen once the canoe was assembled) and used that to clamp and hold it. I used the jigsaw as much as I could to round the curves, and then resorted to this ingenious tool made by my late step-father George E. Reid Jr., who made decoys. It's a plywood handle with a strip of sandpaper stretched between the two ends. I reinforced the sandpaper strip with a piece of rubber, and it works quite well. Since then I have discovered flexible sandpaper—more on that later. 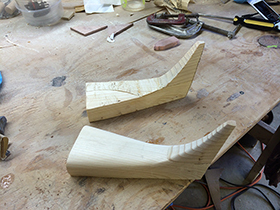 But for shaping curves, this tool was great. Front manu on the left is nearly done, the one on the right still needs more work. George Reid's tool in the center. Now it was finally time to put a deck (pola) on this baby.